Bob is a renowned Canadian aviation historian and author. He grew up in the Yukon in an aviation environment, both in the family sense and in the surrounding activity of life in the north. From a very early age, weekends were spent at the airport with his dad, helping around the airplanes and listening to the “hangar flying” tales of the bush pilots. By the end of Grade 11 he had attained his private pilot's license and a healthy dose of “second-hand” flying experience. After completing his schooling in Whitehorse, he attended the University of British Columbia, graduating with a degree in Mechanical Engineering. By that time he had spent four summers with Trans North Turbo Air, working as an apprentice maintenance engineer on Bell 47 series helicopters in mining exploration camps. University graduation was followed by a year in Montreal working for United Aircraft of Canada, the company producing Canadian Pratt & Whitney engines. When the fortunes of United Aircraft took a dive in 1970, hundreds of the most recent hirees, including Bob and his fellow UBC graduates, were given “temporary” lay-offs. By that time Bob had attained his commercial pilot's license. He decided to follow his heart back to the Yukon flying business. Returning to Whitehorse, he re-joined Trans North, where he remained as a commercial pilot and Flight Operations Manager until his retirement in 2001. Bob is married to Lois (née Gillespie of Mankota, Saskatchewan), and they have two sons, Kyle and Fraser. "A Northern Airways 1929 Fokker Super Universal departs the Fraser River at Vancouver for its home base in Carcross, Yukon - 1937"
In 1974, Bob retrieved the scant remains of this historic aircraft from its decades of abandonment, following an accident near Dawson City in late 1937. In 1998, after 18 years of painstaking restoration by Calgary pilot/engineers Clark Seaborn and Don McLean, CF-AAM rose into the air for the first time in 61 years. Over the next six years Seaborn, McLean and Cameron flew the iconic northern bushplane 35,000 miles to numerous airshows and historic aviation re-enactments throughout North America. Today it resides on permanent display at the Royal Aviation Museum of Western Canada in Winnipeg. Thorough, authoritative, and filled with over 700 superb previously unpublished photographs, Yukon Wings is an illustrated history of the birth and development of the aviation industry in the Yukon. This is an extraordinary story, of almost superhuman perseverance against accidents, disasters, impossible operating conditions and heartbreaking disappointments that would have crushed the spirits of lesser men. It is the story of faith and courage, of pilots who flew aircraft made of wood, steel and cloth, in conditions of bitter cold, relentless snow and zero visibility, often through unforgiving mountain passes that had taken the lives of airmen before them. It is a story of the feistiness and guts of men who defied crazy odds to sink everything they owned into their fledgling air services only to lose it all in some horrific setback, then come back and begin anew – not just once, but over and over. It is the story of hard-driving competitors who fought tooth-and-nail for their share of the market, in defiance of all “common sense” standards of normal business practice. It is a story of men who challenged 40-below temperatures to overhaul a seized engine under an improvised canvas tent hundreds of miles from civilization, or who desperately struggled to save a valuable airplane from a watery grave as it clung precariously to the thin ice of a spring thaw. It is the story of the triumphs and tragedies of men who tenaciously persisted in their determination to bring safe and reliable air service to a frontier land. And best of all – it is a true story. 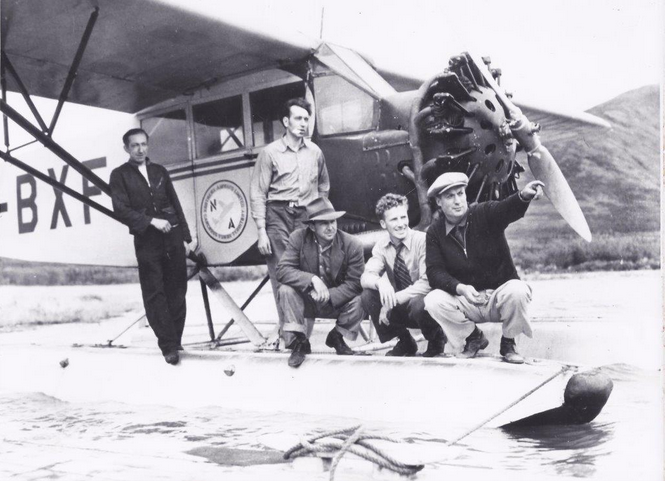 "The anatomy of a northern airline"
A rugged 1928 Fairchild FC2-2W2 with (L to R) aircraft maintenance engineers Bob Dellert and Len Bateman, veteran pilots Jimmy Syme and Herman Peterson, and fiesty Northern Airways president George Simmons. Bob is now restoring this aircraft for permanent display at the Yukon Transportation Museum.